If you’ve been keeping up with social media recently, you may have stumbled on a suddenly viral trend: goat yoga. 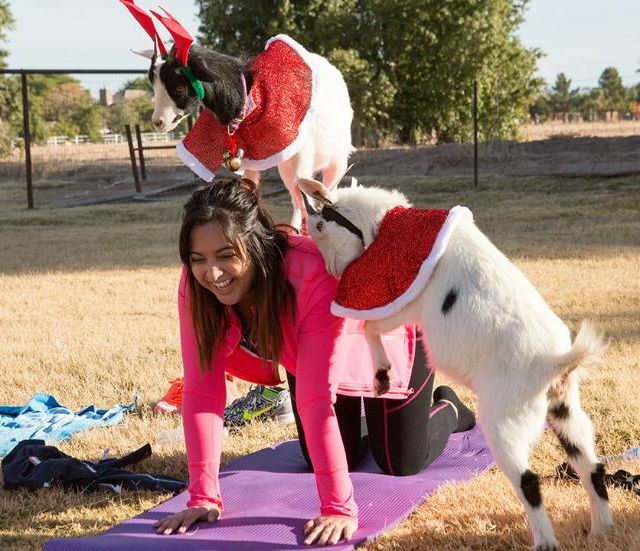 This is not a joke, and goat yoga is exactly what you think it is — a yoga practice that gives people the opportunity to get up close and personal with goats as they (the humans, not the goats) make their way through a sequence of poses. 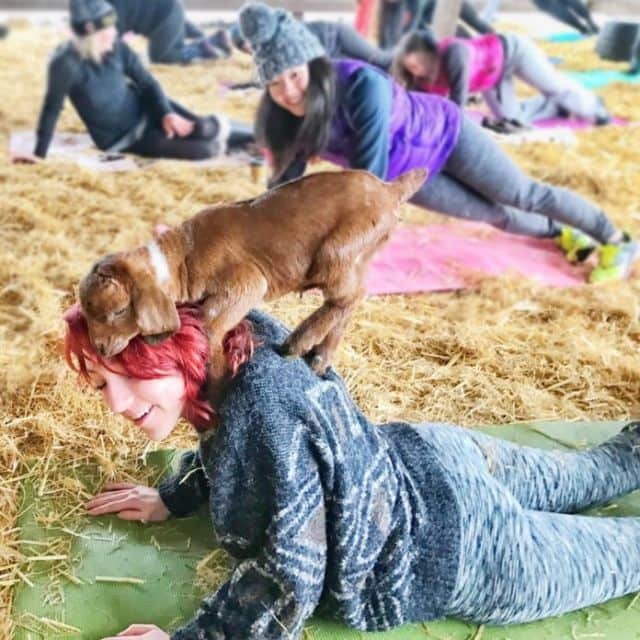 The original Goat Yoga launched in Oregon in 2016, and the wait list for classes there has topped out at nearly two thousand people — not to mention the people lining up to give it a try at other farms and studios. Seriously, are goats the new unicorn? 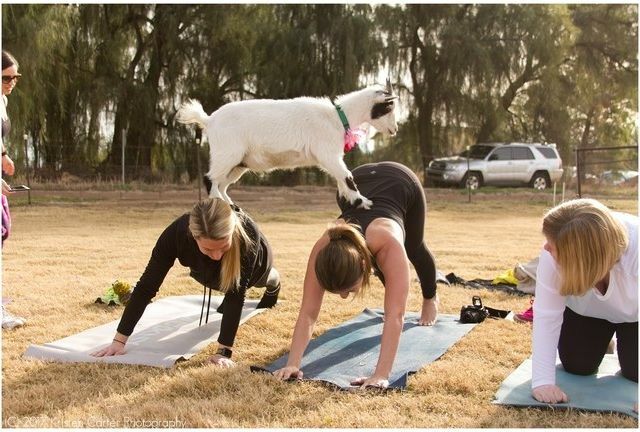 Goats make great yoga companions, but they can also function as targets for your backbends (it’s even better when they resist the urge to be moving targets). They aren’t making leggings and crop tops for yoga goats (yet), but these guys still aim to dress appropriately for class with seasonally-relevant costumes. 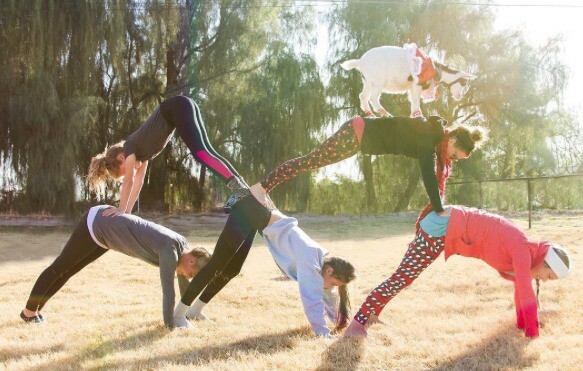 We’re impressed by their commitment to both their yoga practice and their holiday cheer. Even in tree pose, sometimes you’ve just gotta hold a goat. Luckily for the yogi pictured above, goats (or this goat, at least) don’t seem to mind. Yoga classes are a great place for making friends, and basically the only place where you can get this friendly with a barnyard animal. 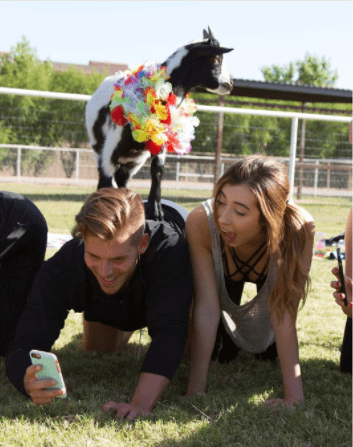 Just like celebrity sightings and skydiving, when it comes to goat yoga, the motto should always be “pics or it didn’t happen.” Naturally, these yogis aren’t missing the chance to snap a selfie with their recently-leid animal friend. 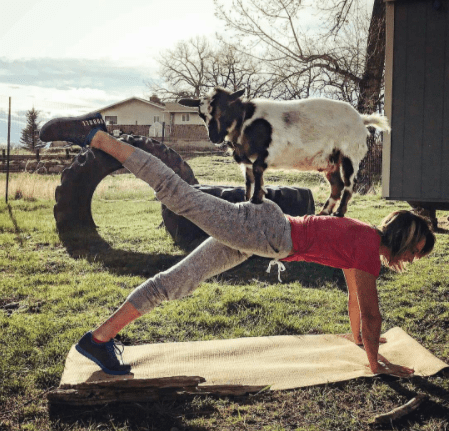 Hooves make it sort of challenging for goats to adjust your poses (in the spirit of our bulldog leaders), but that doesn’t stop them from checking in periodically — and adding some extra weight to your upward-facing dog. 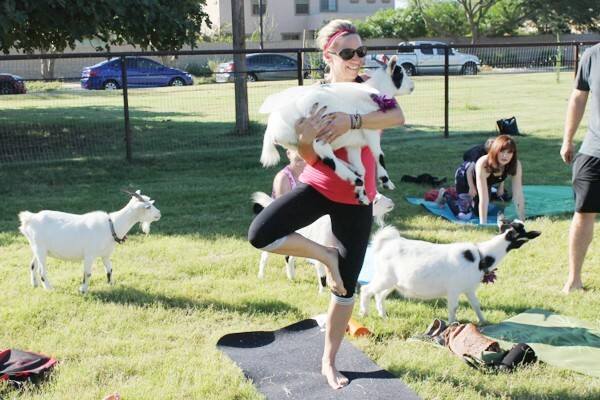 If you thought partner yoga was the ultimate way to spice up your practice, just add goats. The best test of your focus and endurance? Try out your standard poses, then invite a group of adorable creatures to walk on top of you. Adult goats can weigh anywhere from 44 to 300 pounds. If you’re looking to up your game on the mat, putting an animal on your back is a surefire way to test your strength. 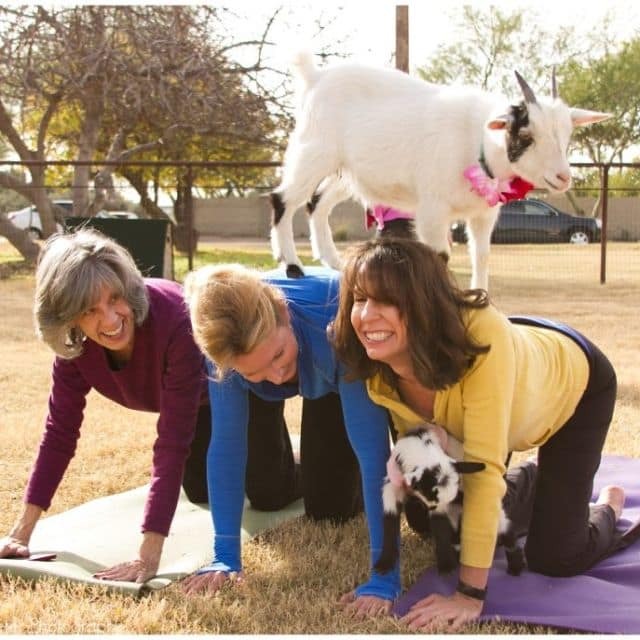 Did you think we would try to illustrate the goat yoga phenomenon with still photos alone? No way! Check out this awesome video of @yoga_girl practicing with her own trusty goat. 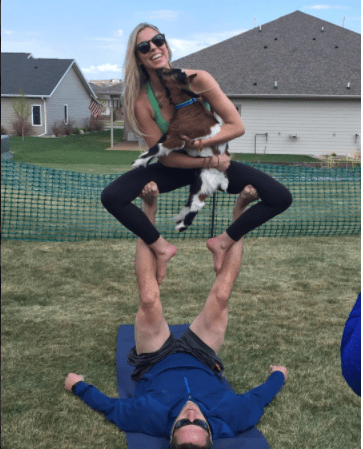 What do you think of the goat yoga trend? Tell us on Facebook + Twitter!